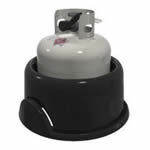 Have you ever had the experience of transporting your propane tank in your car, and having it roll around in the back? The noise is bothersome, and it simply is not safe. In 2008, the National Fire Protection Agency adopted Code No. 58. This requires that every time you transport your propane tank, whether it is full or empty, it must always be kept in your vehicle in a secure and upright position. Easier said than done. That is, until the Tank Nanny® was introduced. The Tank Nanny keeps your propane tanks snug as a bug. Sizes don�t matter. Also the Tank Nanny spares your seats and car interior from wear and tear with its patented seat buffer feature. The Tank Nanny can even be locked into your seat belts. Even if you should store it in the back of a truck without having it locked in seatbelts, the Tank Nanny will keep your propane tank steady, without tipping or rolling. Even if you are driving 35 miles an hour and then make a sudden stop�the Tank Nanny will stand secure as an army tank. Just think about that. If you keep a second tank at home, store it in your Tank Nanny. It is so durable you can leave it out all year. The Tank Nanny. Use the links below to find the best offer on Tank Nanny®.